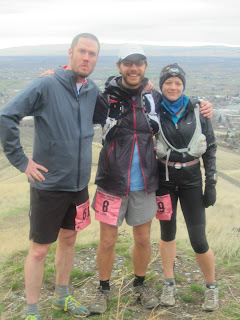 2012 was the second year of the Badger Mountain Challenge and my first 100. I decided to sign up after Seattle marathon with my friend Desiree and later Jeremy. I put my training in place and started to pack on the miles. Unsurprisingly January and February were my highest volume running months ever. I've now run enough marathons and 50k's that I feel I know what to do to complete a race with a goal time. Training for a 100 was different - you don't run 80% of the distance before the race like you would a marathon. 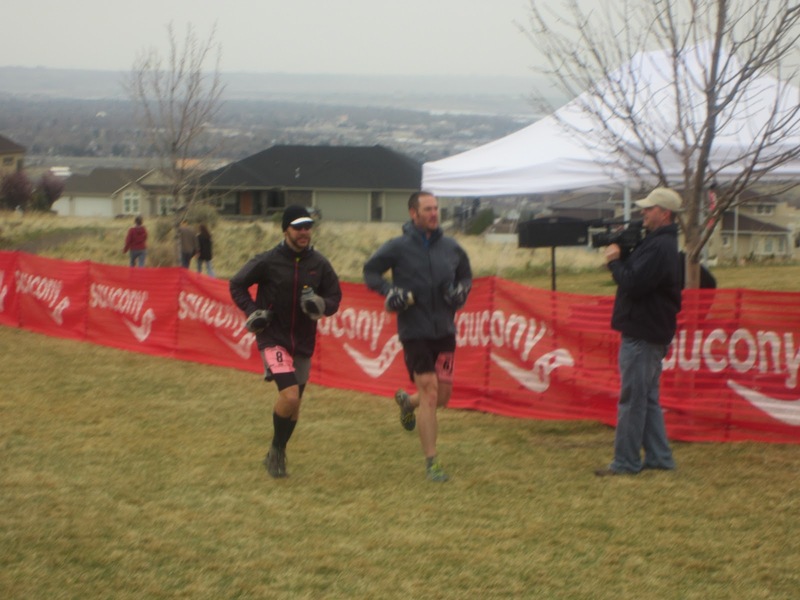 I ran a lot of back-to-back long runs on the weekends and picked the brains of as many 100 finishers as I could. I was most concerned about my stomach - I don't have stomach issues but would I at this distance? - and my feet - I don't blister but would I over 100 miles? I would classify this 100 as "frontier" in nature - definitely lighter on course markings and support than many ultras. 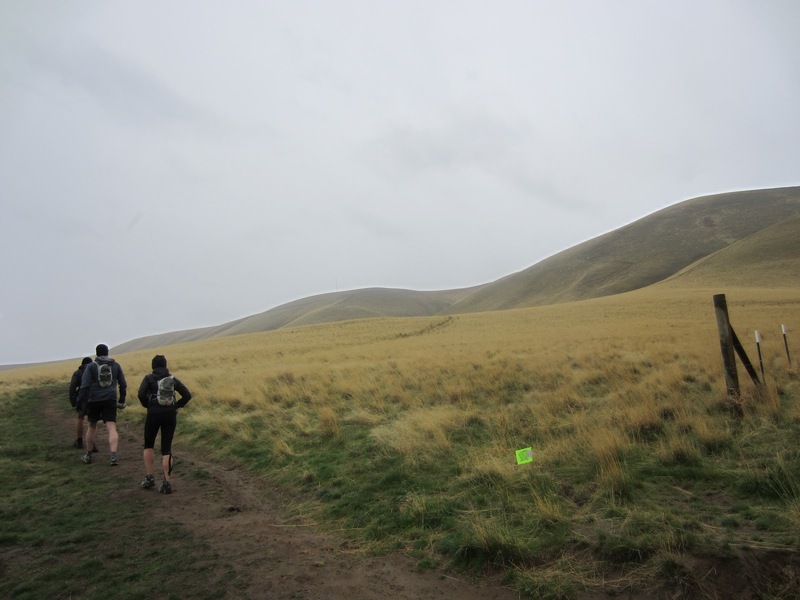 The course had changed a couple of times in the final weeks leading up to the race but I had studied the maps enough I felt confident I knew where we were going. I was the unofficial "tour guide" of the three of us and we were planning on sticking together as long as made practical sense. Desiree and I were trying to make sure to stick together through 78 miles which is when we'd come off the ridge and should be pretty close to morning light. My brother and friend Karlee had agreed to crew for me. Up until the night before the race we worked on our race plan, where they would meet us and when. Desiree had her friend Sarah crewing for her. The race started in a small housing development at the base of Badger Mountain. Unceremoniously we took off. I was reminded to start start slowly as we hiked to the top of 800' Badger. It was raining and windy as we came off the mountain and headed up Candy Mountain and down the other side. We ran through some rollers to get to the base of Red Mountain, our third climb of the day. The wind was still steadily high and the rain had picked up. By the time we were on top of Red we were getting gusts near 60mph and I had pulled my buff over my face to offer some protection. We made it to the Foxhill aid station (16 miles) in 3:15 after a short bushwhack off Red Mountain. I changed out my sopping gloves and snarfed down some food. The next section to McBee Parking Aid was uninteresting. We had some trail finding issues - seems some local property owners had pulled flags. 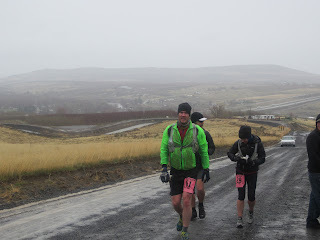 The rain was starting to subside but we were running on asphalt through this section. I snarfed a grilled cheese sandwich my brother got me at a gas station and changed rain jackets before heading out. We were good on pace - 22 miles in less than five hours. 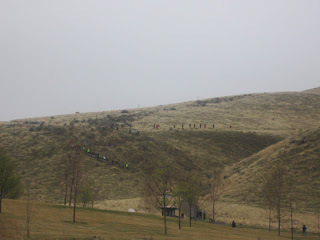 We climbed up to the ridge line up the steepest part of the course - 1100' in about 30 minutes. On the ridge we found jeep & farm trails with lots of loose rock. We worked into a modified Galloway rhythm - we'd run flats and downhills and hike the uphills which worked out to 12-15 min running with 8-10 min hiking. We hit Chandler Butte Aid (mile 27) in another two hours where three people were dropping - broken ankle, hypothermia and some other reason. The rest of the ridge was fairly uneventful - we kept moving and I had the opening theme to Gladiator in my head. We came into Hwy 221 Aid (mile 36) at 4:15 still good on pace. 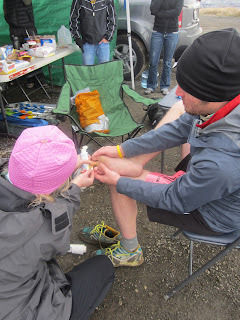 I had a toe blister to tend to so got some aid from Sarah for that. We headed out onto the worst part of the course - 2.5 miles downhill on asphalt highway. This was the new course reroute I was unfamiliar with. We had enough shoulder but were still exposed to the traffic so hugged the guard rail. After 1.5 miles we were able to run off road. From the bottom we made our way through some neighborhoods rather slowly - the amount of asphalt running had worn us down a bit and we were ahead of schedule enough we thought we'd ease off a bit to give ourselves a break. We saw the race leaders coming back the other direction. We made it up to Lincoln Aid (mile 43) which was the most fun stop of the run - great encouragement, very helpful, taking pictures, etc. I had now run farther than I had before! Getting to the turnaround was largely uneventful. We started running into the faster runners and seeing friends and sharing our war stories to that point. We were hearing about other DNFs as well. We made it to the turnaround aid (mile 47) at 7:50 without having to use our headlights. We stopped here for 22 minutes and our aid station stops were starting to get longer. We headed back out into the dark with our lights retracing our steps in reverse. We got through Lincoln Aid pretty quickly and kept moving. The hike up Hwy 221 was unpleasant - trucks were speeding past and were not reducing their brights. The climb only took 23 minutes but it seemed to last forever. We arrived at Hwy 221 Aid cold and ready for a break. 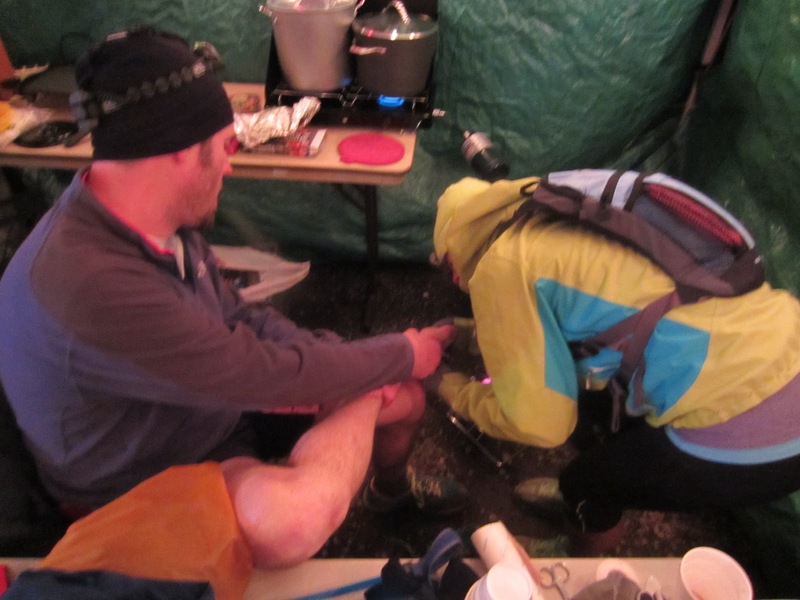 I had some more blisters so Karlee tended to my feet. I added a fleece layer under my rain jacket, put on my rain pants and two layers of gloves. As we were leaving I noticed Desiree was wrapped in a blanket but didn't think much of it. My stomach was not feeling "on" and I hadn't taken much food at the aid station. Karlee was with us for this stretch - we had 22 miles without crew access and we wanted company with fresh legs. As we headed out it became clear that Desiree was cold. I moved in front of the wind to protect her best I could. I was cold too so was hoping that moving up the ridge would warm us up quickly. 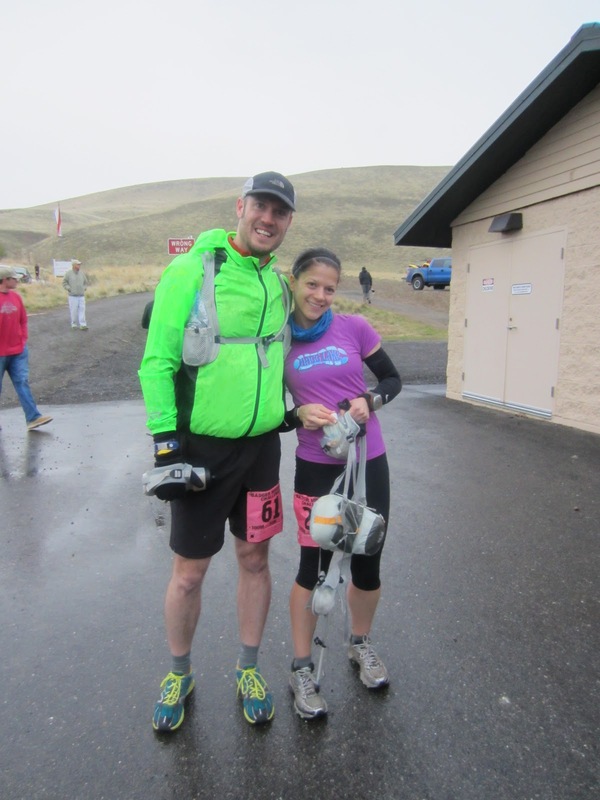 She and I stopped to pop some pepto tabs as we both weren't doing so hot in our tummies. We hiked much of this section (9 miles to Chandler Butte) and it seemed Desiree wasn't warming up. We were on the lookout for barbed wire we had come across on the way out and successfully avoided it. The stars were starting to come out and we had a pretty clear evening although it was cold and windy on the exposed ridgeline. As we started to see the Chandler Butte lights (which never seemed to get closer) I was starting to calculate times and I felt we were starting to hit the edge of the cutoff pace - we were moving to slowly. Jeremy and I pulled into Chandler Butte with Desiree and Karlee five minutes behind us. Desiree was upset - she wasn't able to move quickly and thought she was hurting our chances. We had actually made ok time - 3:17 for the nine miles - but needed to keep that pace up with minimal aid stops. As we left Chandler Butte we had less than 11 hours to knock off 34 miles or so. I helped Desiree down the descent from aid over the rocky path. I knew she was upset and was trying to push but just didn't have much power at the moment and none of us was sure what was wrong. She wanted us to leave her and push out but we weren't doing that up on the exposed ridge. Jeremy came back to her and I got ahead with Karlee. 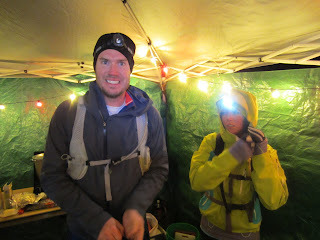 We decided to keep the pace we needed and got to the McBee Ridge Aid (72 miles) at 5:30am. Unfortunately Desiree had gotten hypothermia during the night and was pulled off the course by the aid workers. Jeremy and I pushed forward with Karlee and got down to McBee Parking Aid (78 miles) at 7:05 am having seen a beautiful sunrise in the Horse Heavens Hills. I was warm from running the last seven miles and as the day was rising around us. I pulled off my rain pants, changed shirts and dumped my hydration pack in favor of two water bottles for the run in. Desiree was warming up in Sarah's car and told us to "finish strong" - the least we could do. 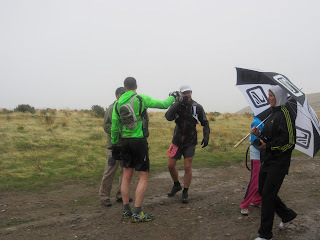 We ran out with my brother and another runner who'd been at aid for a couple of hours recuperating. The ridge we hit next was a punishing series of up and down jeep roads much of which I found unrunnable after over 24 hours on my feet. The sun was coming out and I just wanted water. We passed by the location for the next aid station but it wasn't there. We caught a runner who was having a hard time. Once we got off the jeep trails we were running around the edges of a vineyard with crushed gravel roads which, while runnable, were not pleasant to run on. This was the low point people had talked about. I lost the impetus to move quickly and forced myself to get the group moving a couple of times but we didn't push hard or for very long. We got to a point where we lost the course markings - another property owner pulling flags is my guess - and ended up descending a driveway into a small town which was certainly off course. Jason and I knew where we were and how to get to where we needed to go but tempers were flaring and I was nearly out of fluid. We came into Dallas Aid (mile ~84 for us by this point) at 10:24. There was no way, in my mind, that we could cover the remaining 15 miles in 5 1/2 hours - we were moving too slowly. It had just taken us 3:03 to cover maybe 10 miles. I looked at my brother and said "I think I'm done." Jeremy was talking to the aid worker and looked at me and said "come on. let's go." Whatever fire was lit was lit strong - I grabbed some Peanut M&Ms and refilled my bottle with Nuun and took off. We rocked some sub 8 minute miles for the first 2/3 of this loop through farm country including a 650' ascent. If Jeremy was going to make me go I was going to make him hang on for dear life. 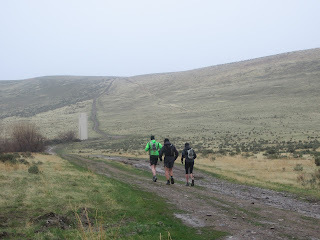 We bombed the downhill and got around to the other side and eased our way back to the aid station to head out. We had just covered 4.5 miles at mile 85 in just over 52 minutes. We had gained back a lot of time. We headed out back toward Candy and Badger Mountains which we could see rising out of the horizon in front of us, taunting us with each step. We were moving into the wind on an asphalt highway but we made decent time running just a bit. We made it through a culvert under the highway and interstate and got up Candy Mountain in 20 minutes. More gravel roads at the bottom relegated me to more hiking - if I was going to be DFL then I might as well be as close to the 32 hour cutoff as possible. We got over to Badger and had a good pace up to the top on the well-groomed trails. The running along the ridge was unpleasant on tired legs so we hiked again. 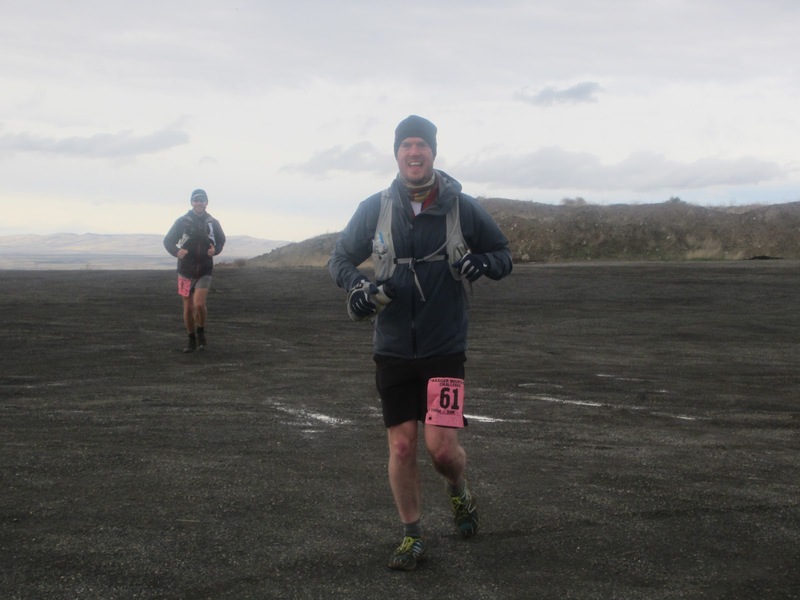 As we came around the edge toward the finish we knew we had to run it in so we bore down and finished with a final descent and sprint to the finish line. 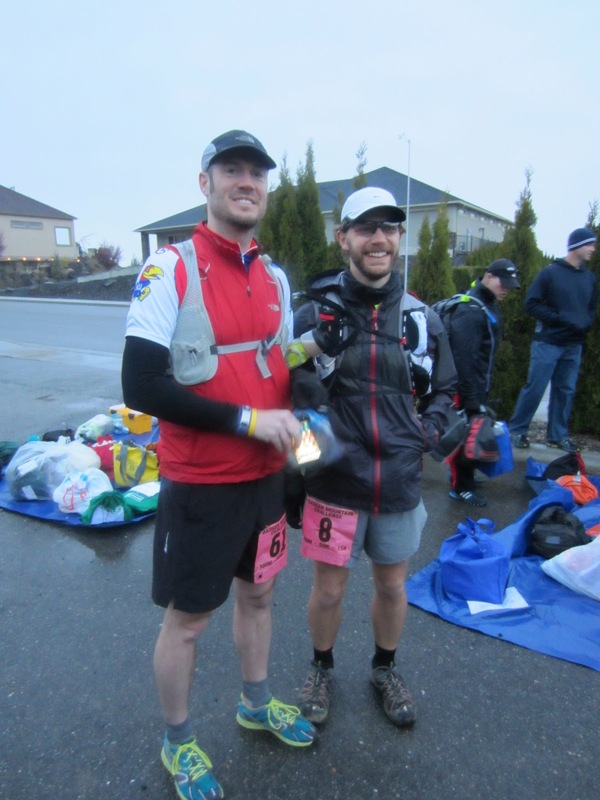 Jeremy and I finished side-by-side in 31:32:18. And not quite DFL. One piece of advice I got before the race was "don't worry about time" and I certainly didn't. We were in good shape at the turnaround for a sub 28:00 finish assuming you hold the same pace throughout. 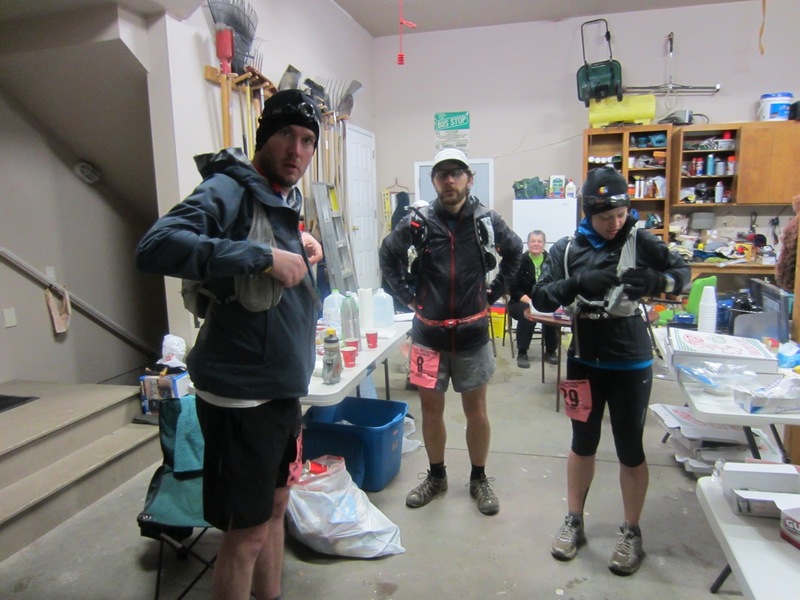 We spent a lot of time at aid stations - over 2 1/2 hours - and could have easily cut an hour off the time right there. There were definite parts (the vineyard, the final stretch) where I could have been running v. hiking but didn't push myself. But for my first 100 this was a great result. Not being able to run in with Desiree makes this a bittersweet result as well. She is a strong runner and was run afoul by something none of us saw coming. But she's going to get it done at Pine to Palm this fall and I'll be there to help. Post race recovery has gone well - almost too well. I didn't have any specific pains in my legs during the run and I have felt great post run (nearly a week now). My feet were swollen but that's subsided and my blisters have gone away. I will not wear my Montrail Rogue Racers again - they just don't fit well and in fact the stitching blew out between the midsole and upper in a couple of places. I will also likely switch back to toe socks to keep the toe blisters at bay. I feel my gear and nutrition were right on target otherwise. I had a great crew helping me out and letting me not sweat the small details during the run. My training also felt right but I'm hoping to add more miles before my next 100. I do have to shoutout to Karlee and Jason who took time off work to follow me around on this crazy quest. They were the best and I couldn't have pulled this off without them. Thank you thank you thank you thank you!!!!! The ever popular question is "will I run this race again" and the answer has shifted from "hell no" during the race to "quite possibly" in my one-week post-race fuzz. We ran 12-15 miles on asphalt but if the Hwy 221 stretch can be figured out that would make the decision easier. Naturally my memories are fond now that I've completed my goal - so we'll just wait and see! Great job, Jeff! 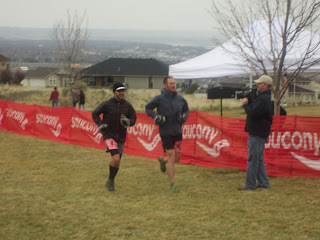 So awesome to see you out there, and congrats on finishing a brutal course in less-than-ideal conditions. You all were very inspiring to me in your determination and good spirits! CONGRATS. I can't believe your pace for the last 15 miles! That's crazy!! And awesome. I also can't believe that you're saying you'd run it again, considering the lack of markers and general lack of communication from the race director. You shouldn't have to deal with property owners -- that's the race director's job. Anyway, congratulations again on your first 100. Color me impressed. There were really only two areas where markers were missing and that was due to locals pulling flags. One area was early on and resulted in some "where are we?" but we never got off course. The second instance was much later in the race so it's possible I missed the flags or they could have been pulled again. Either way we got off course maybe a mile so that's not so big a deal. We were yelled at around 11pm running up Hwy 221 asking what we were doing when running across some property. When we explained we were allowed to be there we were left alone. I don't know the extent to which there were unhappy property owners or areas where we didn't have permission to run. I think some of the stories are speculation (for instance I *heard* that someone "not a property owner" was yelling at a runner for being on private property - not sure how you RD that) so as I talk to others that ran I'll see what happened. My biggest complaint was the reroute onto Hwy 221 which added far too much road running to a "mountain 100" and was quite dangerous given the speed of traffic. 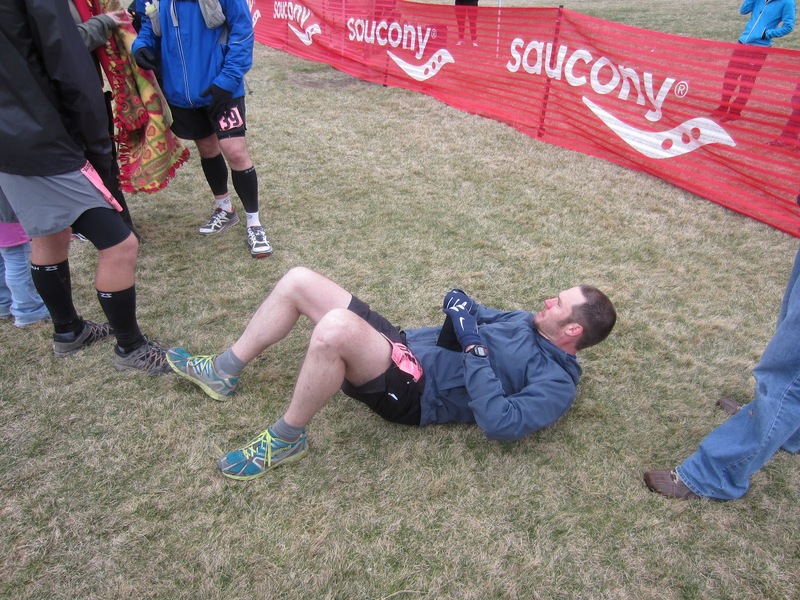 Missing an aid station later in the race was not ideal either but I had enough aid to make it through. Great report...a job incredibly well done Jeff!!!! 2. Vị trí ngồi nên tạo thành đường thẳng trực tiếp với cửa vì bạn có thể nhận phải nguồn năng lượng tiêu cực. Bạn nên chuyển ghế ngồi của bạn sang vị trí khác để tránh năng lượng tiêu cực đi qua cơ thể. Nếu lưng của bạn buộc phải quay về phía cửa khi ngồi vào bàn văn phòng giá rẻ , bạn có thể giảm bớt ảnh hưởng tiêu cực bằng cách nhìn thấy hình ảnh phản chiếu của cửa. Hãy treo gương hoặc bất kỳ đồ vật phản chiếu nào xung quanh bàn làm việc để tạo tương phản.